Cottage on the Edge - the DIY Cottage Blog: Hurricane Clips! What Hurricane? 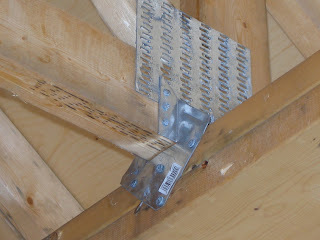 The roof trusses were secured at each of the outside, and load bearing walls, with something calls a hurricane clip. The uplift under the eaves during strong wind could be strong enough to rip off the roof.